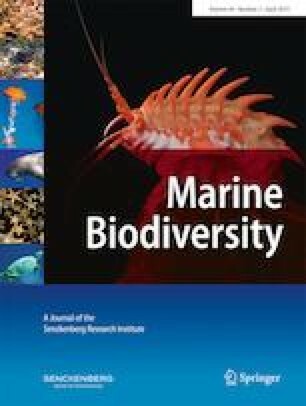 Changes in climate-related factors such as ice coverage, water temperature, and ocean currents have been proposed to facilitate an increased interchange of species in the High Arctic between the Pacific and Atlantic oceans. In Greenland, the colonization of the mussel species Mytilus edulis has been suggested to have occurred recently and exclusively from Northwest Atlantic populations. The source population for its sibling species Mytilus trossulus is however unknown, and therefore we aimed to explore its genetic origin. Using 54 SNP markers, M. trossulus was identified from three Greenland blue mussel populations collected in 2012–2014 and the relative similarities to Northwest Atlantic and North Pacific M. trossulus populations were assessed. Populations were found to fall into two clades. The North Pacific is the most likely source for the northern Greenland M. trossulus probably as a result of occasional postglacial long-distance dispersal through the Bering Strait. Our findings in M. trossulus are in agreements with the predictions that climate change will, in addition to driving a northward expansion of temperate-boreal species into the Arctic Ocean, increase the rate of trans-Arctic interchange between the Atlantic and the Pacific oceans. The online version of this article ( https://doi.org/10.1007/s12526-018-0870-0) contains supplementary material, which is available to authorized users. The authors gratefully acknowledge Anders Mosbech and Rune Dietz for sampling of mussels at Savissivik in northwestern Greenland, and Dr. Peter Cranford for providing samples from Canada. We thank Jonathan Gardner and Jean-Pierre Desforges for valuable comments on the manuscript. This study was partially funded by the 2011/01/B/NZ9/04352 NCN project for R.W., the Leading National Research Centre (KNOW) - the Centre for Polar Studies for the period 2014–2018 and statutory topic IV.1. in the IOPAS. L.B. received financial support from the Ministry of Environment and Food of Denmark.